Lukwago VS Kamya: Will legal path solve impasse at City Hall? The battle for power at City Hall between the Lord Mayor Erias Lukwago and Kampala minister Beti Kamya is taking a new twist. Yesterday, Mr Lukwago resorted to the High Court to restrain and prevent Ms Kamya from purporting to act the political head of Kampala city. 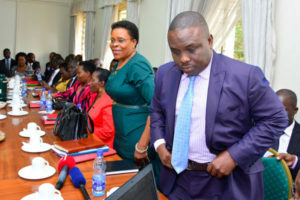 Lukwago accuses Kamya of plotting, through the KCCA amendment Bill, to reduce the powers of the Lord Mayor from being the political head of the city, to just a ceremonial leader. Lukwago also wants court to reverse the decision of the minister contained in her communication to the authority, dated January 23, regarding the legality of Kampala Capital City Authority meetings. Will legal channels solve the problem? Between 2012 and 2013, the same situation emerged between Lukwago and Jennifer Musisi, the city executive director Jennifer Musisi. At that time, Lukwago accused Musisi of usurping his powers. He ran to court and it ruled that the matter be solved at City Hall. Some legal and political analysts think not a lot will be achieved through legal avenues which Lukwago has decided to take. Like President Museveni says, courts cannot solve political disputes, Ibrahim Kasozi, the Makindye East MP agrees. He explained that Lukwago should take on Kamya, politically, by mobilising the city dwellers, to rally behind him. “He is wasting his time to go to court. When he went there, what did he achieve? He has the majority opposition councillors, let him organise rallies in Kampala, as means of mounting pressure on government,” Kasozi argues. 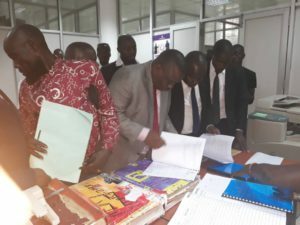 In his petition to court, Lukwago said having been duly elected in 2016 general elections with close to 80 per cent, and he took office in June 2017, he has since diligently executed his duties under the KCCA Act. But Kamya has persistently interfered with his mandate and duties as the Lord Mayor. “Since inception, the situation has been hostile, but they have tried to contain it internally, hopping that their colleagues at KCCA will listen and act within the presincts of the law, until now when he has decided to seek legal action to protect the sovereignty of the people,” Kasozi says. Crispin Kaheru, of the Citizen’s Coalition for Electoral Democracy in Uganda (CCEDU), argues that creating three centres of power at City Hall was the root cause of problems. Some legal brains seem to agree with Lukwago, arguing that dragging Kamya to court will help to streamline the functions of each of them. Kaheru predicts that court will not solve the matter, adding that it requires a political solution. According to Kaheru, the KCCA Act was enacted in 2010 to help NRM government manage the city directly. “This is why the President appointed Kamya. She was appointed for political mobilisation. Her mission is to turn around rebellious Kampala dwellers and neutralise the political opposition,” Kaheru noted. In July 2016, while President Museveni was meeting residents in Kawempe Division, Kamya assured him that in the next general elections, he will win Kampala city. “But we need the Constitutional Court to interpret the KCCA Act. The Act says KCCA is headed by the Lord Mayor and his councillors, at the same time it states that the city is directly managed by the Central Government,” explained George Musisi, a lawyer working with the Foundation for Human Rights Initiative. According to Musisi, the KCCA Act states that the authority is comprised of the Lord Mayor, the deputy and the councillors. “The technical people are just employees, who are supposed to report to the Lord Mayor and the councillors,” he added. Lukwago also said he has on several occasions written formal requests to the minister to attend Authority meetings to iron out several issues relating to the development of the capital city but she has boycotted them. He also accused Kamya on several occasions of arbitrarily taking unilateral decisions and purported to implement the same without involving the office of the lord mayor as the political head of the authority. Lord mayor Erias Lukwago peruses court documents at the High Court in Kampala yesterday. Will his latest move yield results?